A favorite of asian cooking, Thai Basil has a slightly sweet anise flavor compared to Italian basil. The stems are purple as well as the flowering tops which can be used as a garnish. Request flowers only if a garnish is needed, otherwise the small bag will contain mainly the leafy tops. 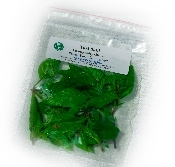 Just like Italian Basil store at 45 deg F but Thai Basil is not as sensitive to cold as Large Leaf Italian Basil.